Online catalogues offer the ability to continously update catalogue entries as new information becomes available. They also provide the opportunity to publish scholarly work on areas of the collection for which there are no printed catalogues. This catalogue accompanies the first ever loan exhibition of drawings from Waddesdon Manor. The drawings are among the least-known aspect of Waddesdon’s collection. They are rarely displayed because exposure to light and changes in relative humidity damages works on paper. Around 1500 of them are stored in boxes in one of the towers that make up Waddesdon’s startling silhouette. Hundreds more are bound as books or pasted into albums in the Morning Room. Still more are framed and hung on walls, fixed to screens or arranged on tabletops with photographs and jewelled boxes. 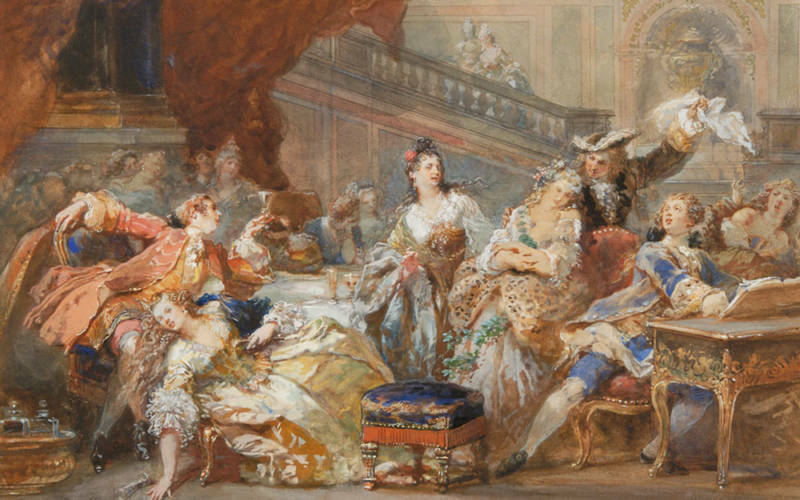 There are works by major French draughtsmen of the eighteenth century, including François Boucher, Jean-Honoré Fragonard, Jean-Baptiste Greuze, Nicolas Lancret, Gabriel de Saint-Aubin and Jean-Baptiste Le Prince. Other artists are less familiar (perhaps because they were not primarily painters), Charles-Nicolas Cochin and Moreau the Younger among them, and it is hoped that this exhibition will introduce the visitor to the verve and originality of their work. In this quintessentially nineteenth-century collection of eighteenth-century French works of art, the emphasis is on ‘the sweetness of life’- scenes of modern society, nostalgic glimpses of the past and idealised fêtes galantes. However, images of Roman stoicism, the torture of Christ and the effects of artillery bombardment introduce more sombre notes. The exhibition does not set out to survey a period or its styles, nor does it offer a genealogy of artists and their influences or an account of academic theory or technical practice. It reflects the nature of the drawings collection as a whole, with its eclectic shifts of focus, its delight in intimacy and detail, and its interest in the marginal as well as the definitive. Our catalogue can be viewed online which is very valuable as these drawings are rarely on display. Read more about the history of the collection below or click here to look at specific drawings. 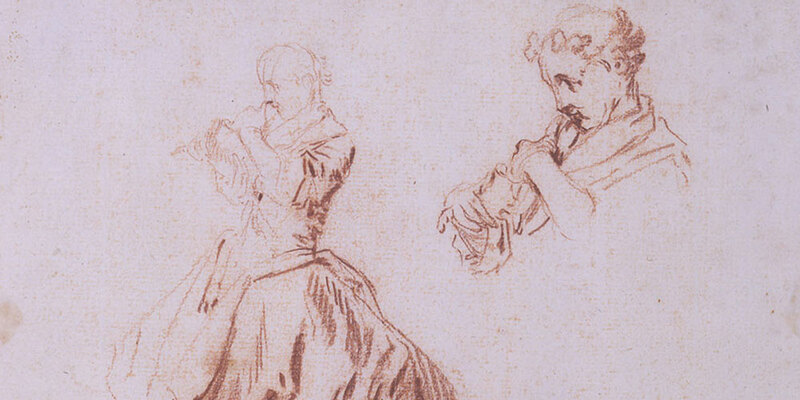 In accordance with his wishes, Edmond’s heirs gave almost all of his Old Master drawings to the Louvre. These were mainly Dutch, Flemish and Italian and numbered almost 3,000. [v] His collection of over 40,000 engravings, in the acquisition of which he had aspired to encyclopaedic completeness, also went to the Louvre. These included many eighteenth-century French works, most notably those after François Boucher. [vi] However, for the most part, his eighteenth-century drawings (along with nineteenth-century prints and the bound volumes) were bequeathed to his heirs. Of the drawings that found their way to Waddesdon through this inheritance, most are French. For Edmond, France was supreme. He declared that “la supériorité de la France dans les temps modernes n’était pas contestée…Se renouvelant à chaque siècle, dans des styles aussi variés que ceux de Louis XIV, Louis XV, Louis XVI, toutes les formes de l’art y brillèrent d’un incomparable éclat” (France’s superiority in modern times was not disputed…Renewing itself with each century, creating styles that are as varied as those of Louis XIV, Louis XV, Louis XVI, all forms of art shone with an incomparable lustre). [i] Edmond’s thousand or more drawings for architecture and ornament offer French design as the aesthetic model for all nations, from hats to carriages, bath-houses to altars. He did acquire drawings by British, Dutch, German and Italian artists, but they were either originally bought as French works or earned their place in his collection as evidence of the dissemination of French Rococo and Neoclassical styles throughout Europe. Several of the drawings in this exhibition bear witness to their nineteenth-century owners’ interest in printmaking. One was copied from an engraving (cat. no. 7) while many others were made to be engraved. Edmond de Rothschild, one of the greatest of all collectors of engravers, argued that the technology of printing had originated in France. [v] Like Ferdinand, he was also an avid bibliophile. Both cousins were fascinated by the relationship between text and image and saw eighteenth-century French book illustration as an artistic and technical highpoint. Ferdinand’s albums contain a copy of Gilles Demarteau’s chalk-manner engraving after Le Prince’s Young woman in Russian costume, while Edmond owned the red chalk drawing (cat. no. 42). Desprez’s drawing of a popular Neapolitan festival (cat. no. 31) was made for an illustration in the abbé de Saint-Non’s Voyage pittoresque, ou description des royaumes de Naples et de Sicile, a copy of which is still to be found in Ferdinand’s library at Waddesdon. Bernard Picart’s drawings of Dutchmen (cat. nos. 38-40) are further examples of these parallel patterns of collecting – the drawings acquired by Edmond, and the prints by Ferdinand. The appearance and exploits of foreigners as perceived by French draughtsmen is a recurring theme in this exhibition – from the already mentioned Dutchmen, Neapolitans and Russian to Polynesian islanders (cat. no. 7) and Suliote warriors (cat. no. 74). However it is the French who dominate it. Portraits scrutinise the faces of individuals, some known, some unidentified, including a cleric (cat. no. 52) and a soldier (cat. no. 51), some in childhood (cat. no. 56) and some in middle age (cat. no. 53). A sense of life-likeness and authenticity and the illusion of human presence in these works was constructed using a variety of formats and media, with high finish (cat. no. 55) or conspicuous speed (cat. no. 54). There are observational figure drawings and others that distil observed reality into idealised or fantastical compositions. Others placed emphasis on social types and aim to record manners and morals as well as appearances. One of the most memorable series of drawings at Waddesdon is the group by Moreau the Younger for the famous Suite d’estampes pour servir à l’histoire des mœurs et du costume des François dans le dix-huitème siècle(cat. nos. 43-45), three of which are included in this exhibition. Among the most sophisticated of fashion plates, they were also intended to serve as records of modern Parisian social mores. In the nineteenth century, they were revered as records of a vanished society. 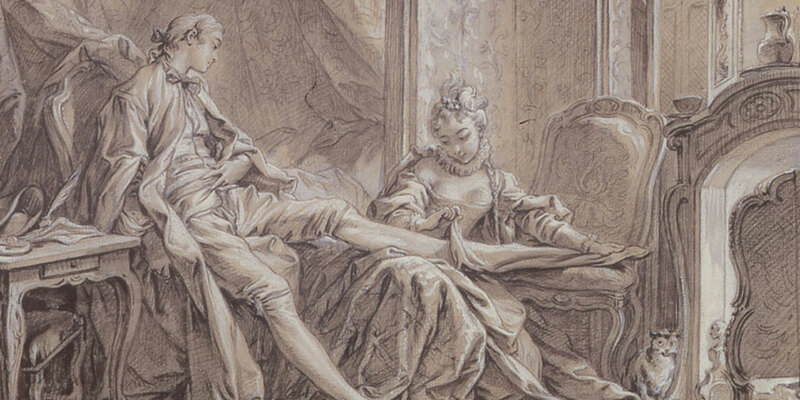 The Waddesdon drawings also illuminate the settings and material trappings of French eighteenth-century life, from churches and prisons to boudoirs and carriages. Edmond de Rothschild was among the first collectors of drawings for architecture and ornament. [vi]He bought them mainly in Paris during the 1880s and 1890s, when interest in them began to flourish, sometimes from the descendants of the artists themselves. He acquired substantial series associated with the Bâtiments du Roi (the department of the French royal household dealing with the king’s buildings) and others by such outstanding draughtsmen as Juste-Aurèle Meissonnier and Jean-Charles Delafosse. Another pioneering contemporary in this field, Charles-Philippe de Chennevières, who organised the first exhibition of dessins d’ornament in 1880, mourned their neglect by “ignorant and short-sighted pedants”. [vii] For him they demonstrated the creative suppleness of some of the greatest artists and gave incomparable insight into the tastes of their time. Some of Edmond de Rothschild’s designs for ornament were made with no intention that they should be executed. They explore the possibilities of mark making, motif, pattern and style. Others offer glimpses of the places, props and personal accoutrements that made up the private and public mises en scèneof people’s lives. Some sheets bear the stains and creases of workshop use (cat. no. 11), while others are highly finished compositions, intended to fix a contract or seduce a potential client (cat. no. 24). Some are inscribed with measurements or instructions to aid the realisation of a design, augmented with marginal sketches or finished with a signature. Several drawings reveal evidence of duplication – pricking, scoring, squaring up, rubbing the back of the paper with red chalk and going back over the composition with a sharp point – which hints at the collaborative process of making things. In some cases, subsequent translation into prints propagated designs or enhanced the reputation of their inventor (cat. no. 14,15,23). In the nineteenth century, drawings for ornament served as raw material for the splendid interiors which formed the settings of many Rothschild lives. Even today, they continue to inspire new rooms (cat. no. 45). Ferdinand was proud of his family’s revival of French eighteenth-century style “in its purity, reconstructing their rooms out of old materials, reproducing them as they had been during the reigns of the Louis, while at the same time adapting them to modern requirements”. Built from scratch like many of the Rothschild houses, Waddesdon combined authentic old materials with historical pastiche and audacious novelty. Its exterior is a knowing homage to French Renaissance châteaux. Its rooms are lined with real French eighteenth-century panelling, adjusted, stripped and reassembled to fit the proportions and practical requirements of a Victorian country house. Ferdinand’s new house did not try to blend into its surroundings or suggest an ancient landed lineage. There is irony in the reuse of dress fabrics and ecclesiastical robes for curtains and upholstery. He, and subsequently Alice, created arresting ensembles with treasures of all kinds, picking and choosing from the old collections being sold off across Europe as he built. Waddesdon is suffused with a playful air of disguise and masquerade. The collections brought to Waddesdon through inheritance from the French branch of the family consolidated this theme, not least in the collections of clothes and accessories (including fans, buttons and lace) from Edmond’s wife, Adelheid (1853-1935), many of which had been adapted and worn. Historicising fancy dress complimented the splendid interiors of the many French and British Rothschild houses (including Ferrières in Seine-et-Marne, rebuilt by Joseph Paxton and G. H. Stokes with interiors by Eugène Lami for Edmond’s father James de Rothschild and Mentmore, Buckinghamshire, built by the same architects for Mayer Amschel Rothschild, Ferdinand’s cousin and uncle-in-law), which incorporated treasures from old buildings with modern interpretations of them. Theatre and spectacle are prominent themes at Waddesdon. There are several actors among the British portraits and the shelves of the Morning Room attest to Ferdinand’s fascination with seventeenth and eighteenth-century French theatre. His interest encompassed puppet theatre and street performers as well as the grandest of royal masques. Both he and Edmond owned hundreds of designs for theatrical costume and drawings and engravings of actors (cat. no. 48), musicians and stage sets (cat. 28). The royal associations of so many works of art on display at Waddesdon and their aura of luxury and splendour might suggest an unquestioning nostalgia for the luxury and splendour of the ancien régime. However, like his own writings, the works on paper that Ferdinand gathered together reveal a more ironic, essentially Liberal, approach to French history, from caricatures mocking Church, Crown and State to records of the activities and aspirations of the lower and middling classes. Alongside masterpieces by canonical artists and designers, Ferdinand acquired board games, trade cards, theatre tickets, sweet wrappers, documents binding or releasing individuals to or from the army and Revolutionary ephemera. While Edmond owned drawings by some of the greatest artists of the Renaissance and Baroque (he intended to devote a whole room to the work of Rembrandt), neither he nor Ferdinand was particularly drawn to their French equivalents. Like Edmond (who bought en bloc Jean-Louis Soulavie’s collection of drawings and prints relating to the French Revolution, from the street to the throne-room), and other contemporaries including the novelist Honoré de Balzac (1799-1850), the collectors Edmond and Jules de Goncourt (1822-96 and 1830-70) and the architect of Waddesdon Manor Gabriel-Hippolyte Destailleur (1822-1893) , Ferdinand was drawn not only to elevated, prestigious and technically accomplished works of art but to drawings that gave access to the specifics of historical events and the quotidian texture of lived lives. This selection of drawings from Waddesdon can only hint at what is there. Beyond the constrictions of space and practicality, the terms of the bequest of the house and collections to the National Trust in 1957 mean that only some works can travel, This rules out many of Ferdinand’s volumes of drawings, including the designs for Louis XIV’s court masque, the Ballet de la Nuit, and the unique and subversive Livre de caricatures tant bonnes que mauvaises by members of the Saint-Aubin family. 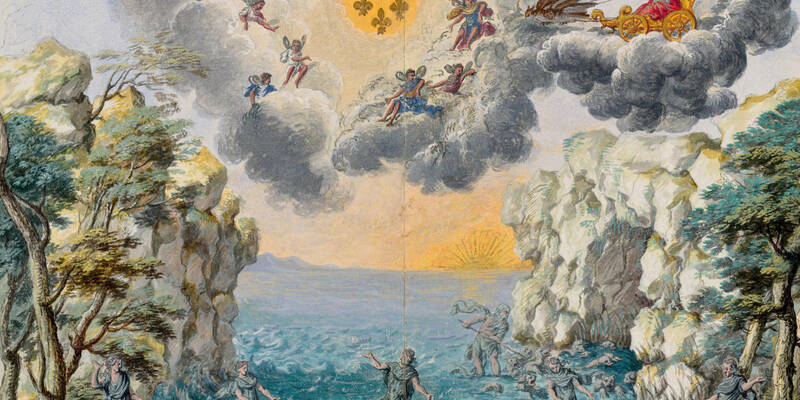 It also rules out some of the better-known sheets, for example, Gilles-Marie Oppenord’s drawing of a chimneypiece probably intended for the Palais Royal and François Boucher’s La courtisanne amoureuse. Nevertheless it reflects the diversity of the Rothschild Collection and the overlapping preoccupations and unflagging curiosity of its creators. It encompasses observation and invention, academic learning and social comment, propaganda and reportage, and sheds light on the many different techniques and uses of drawing. It is hoped that scrutiny of these works outside their usual context will intrigue those that do not know Waddesdon, surprise those that do and give insight and pleasure to new audiences. [i] For a discussion of the emergence of the essentially nineteenth-century word ‘bibelot’ see Dominique Pety, Les Goncourt et la colletion de l’objet d’art à l’art d’écrire, Geneva, 2003, particularly pp.68-69. [ii]Ferdinand de Rothschild, Bric-à-brac, 1897. See Michael Hall (ed), ‘Bric-à-Brac. A Rothschild Memoir of Collection’, Apollo, vol. CLXVI, no. 545, July & August 2007, pp. 50-77. [iii] See Colin Bailey, ‘Conventions of the Eighteenth-Century Cabinet de tableaux: Blondel d’Azincourt’s La première idée de la curiosité’, The Art Bulletin, vol. 69, 1987, pp. 431-47; Suzanne Folds McCullagh, ‘Eighteenth-century French cabinet drawings’, Diana Dethloff (ed. ), Drawing: Masters and Methods from Raphael to Redon. Papers presented to the Ian Woodner Master Drawings Symposium at the Royal Academy, London, 1992, pp. 89-102. [iv] In contrast with Edmond’s meticulous records, little is known about the history of most of Ferdinand’s drawings. The inventories made after his death rarely specify individual drawings so it is difficult to be sure whether those listed in Alice’s posthumous inventories were acquired by her or by Ferdinand. [v] For Edmond de Rothschild as a collector of prints and drawings, see Suzanne Coblentz, La Collection d’Estampes Edmond de Rothschild au Musée du Louvre, Paris, 1954 and Waddesdon Drawings Catalogue 1, pp. 9-18. [vi] Pierrette Jean-Richard, L’Œuvre gravé de François Boucher dans la Collection Edmond de Rothschild, Paris, 1978.
i] Edmond de Rothschild, Notice sur la vie et les travaux de M. Henri Bouchot, Paris, 1908, p.16. [ii] Waddesdon itself is home to an important collection of Dutch and Flemish works from the Golden Age of Netherlandish painting, by artists including David Teniers the Younger, Aelbert Cuyp, Gerard Dou and Gabriel Metsu. Collections of Netherlandish paintings are among those bought en bloc and shared out between more than one Rothschild. For example, the collection of the Van Loon of Amsterdam was purchased in 1877. See Michael Hall, Baron Lionel de Rothschild as a Collector of Paintings, PhD dissertation,Courtauld Institute of Art, 2005. [iii] Edmond de Rothschild’s drawings in the Louvre include fourteen volumes of designs for costumes for ballets and court entertainments from the reigns of Louis XIII and Louis XIV. Ferdinand de Rothschild also owned hundreds of designs for costumes and sets, mainly from the eighteenth century. While his books reveal a passionate interest in French theatre and spectacle, painted portraits of the stars of the eighteenth-century British stage manifest this thematic strand more conspicuously. [iv] For the panels depicting the story of Sleeping Beauty (1913-24) commissioned by James de Rothschild, see Diana Souhami, Bakst. The Rothschild Panels of the Sleeping Beauty, London 1992; Haviva Carmeli and Doron J. Lurie (eds. ), Leon Bakst: The Sleeping Beauty, exh. cat., Tel Aviv Museum of Art, 1992-93; Yelena Bespalova, ‘Bakst’s Panels for the Rothschilds in Waddesdon’, Russian Fine Art Magazine, no.3, 2006, pp.29-39. [v]Dessins et Estampes du XV ? au XVIII ? siècles de la collection Edmond de Rothschild, exh. cat., Fundación Juan March, Madrid, 2004-05, pp. 16-17. [vi]See further Waddesdon Drawings Catalogue. [vii] See Catalogue descriptif des dessins de descriptif des dessins de décoration et d’ornement de maîtres anciens, exposés au Musée des Arts décoratifs en 1880, Paris, 1880, p.I ; Louis-Antoine Prat and Laurence Lhinares, La collection Chennevières: Quatre siècles de dessins français, exh. cat., Musée du Louvre, Paris, 2007. Ferdinand de Rothschild, 1897: Hall 2007 (see note 2), p.55. Pauline Prevost-Marcilhacy, Les Rothschild: bâtisseurs et mécènes, Paris, 1995. For his low opinion of Louis XV and Louis XVI, his sympathy for Marie- Antoinette, and his belief in the inevitability and broadly beneficial nature of the French Revolution, see Ferdinand de Rothschild, Personal Characteristics from French History, London, 1896. See Un collectionneur pendant la Révolution: Jean Louis Soulavie (1752-1813), exh. cat., Musée du Louvre, Paris, 1989.